A husband is sitting home alone waiting for his wife to return when he hears a knock on the front door. There are two policemen there. One of the policemen asks if he is married, and if so, can he see a picture of his wife. The guy says, “Sure” and shows him a picture of his wife. 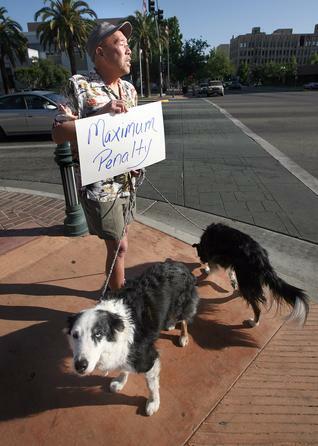 Steve Yue, from Delano, brought out his dogs to protest for the maximum penalty for Robert Gonzales, who was scheduled to be sentenced for animal abuse Thursday in Kern County Superior Court.